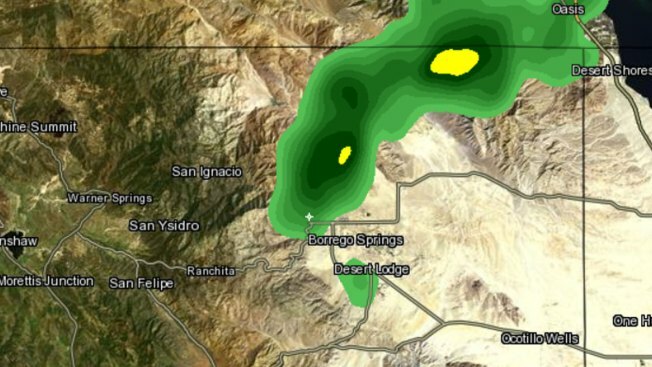 A Flash Flood Warning has been issued for Borrego Springs and surrounding areas as well as south central Riverside County. The alert goes through 2 p.m. PT Monday. The rain falling with this storm ranges from 1.5 inches to 2 inches per hour. Flooding was possible along State Route 22. A flash flood warning means a flash flood is imminent or occurring in the warned area. If you live or travel in an area under a flash flood warning, get to high ground. Do not cross streams on foot where water is above your ankles. Do not attempt to drive through water-filled areas of unknown depths. If your vehicle stalls in rising water, get out of it and get to safety. Many people become trapped by trying to move a stalled vehicle.